Israeli soldiers abducted, overnight until early morning hours Wednesday, 26 Palestinians, including children, during invasions and violent searches of homes in different parts of the occupied West Bank. 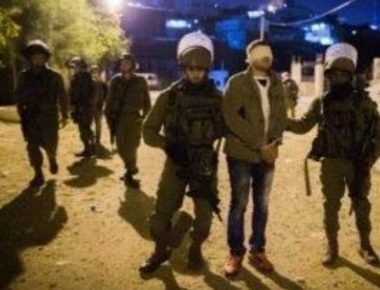 The Bethlehem office of the Palestinian Prisoners Society (PPS) has reported that the soldiers invaded the city, and several surrounding towns and refugee camps, and abducted eight Palestinians, including three political prisoners. The abducted Palestinians have been identified as Eyad Habib Mohammad, Waleed al-Bustanji, Yousef Lahham, Omar Aziyya, Khaled Az-Zeer, Waseem Abu Yabes, Ismael az-Zeer and Nizar Najjar. In Ramallah, the soldiers abducted seven Palestinians, including a child and three young women, after invading their homes and searching them. The Ramallah office of the PPS said the abducted have been identified as Yazan Maher Sheta, 25, Mohammad Eyad Zakarna, Ekrema Ayyoub, Soheib Omar Kharraz, 15, and three young women; Bayan Safi, Zeinab Barghouthi and Miran Daghra. Furthermore, the soldiers abducted six Palestinians from their homes in different parts of the southern West Bank district of Hebron. They have been identified as Ismael Mohammad Hawamda, Jibreel Mohammad Hawamda, Eyad Thiab Abu Qbeita, Mo’tasem Maghalsa, 19, Mohammad Bassam ‘Allama, 17, and Ma’moun Ahmad ‘Allama, 15. In Nablus, in the northern part of the West Bank, the soldiers abducted four Palestinians, identified as Mos’ab Hasan Marshoud, Yahya Lutfi Marshoud, Mo’tasem Ahmad Khatib, and Ahmad Khader. One Palestinian, identified as Hasan Daraghma, was abducted from his home in Tubas, in the northeastern part of the West Bank. The PPS said that some of the abducted Palestinians are former political prisoners, who spent years in Israeli detention and interrogation centers.